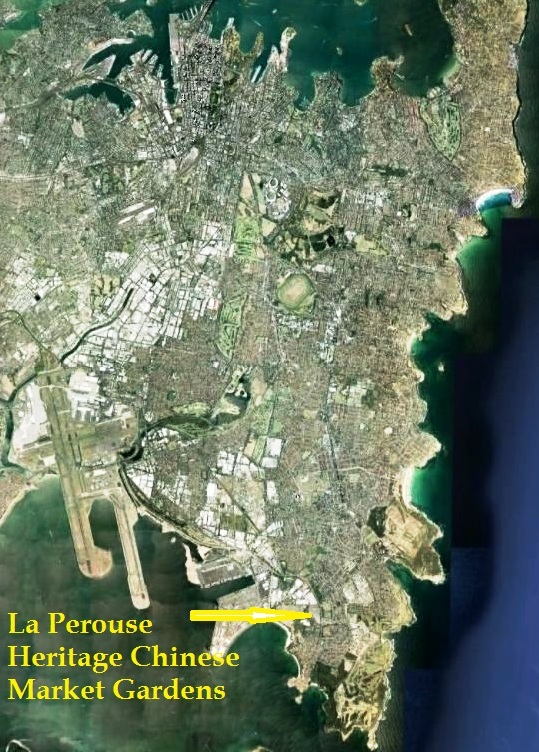 This website was set up to support the La Perouse Chinese Heritage Market Gardens in Phillip Bay, Sydney. Members of the support group can be reached via the contact page on this site or through the Facebook page. The Chinese Market Gardeners (pictured below) operate under a Crown Lands licence. 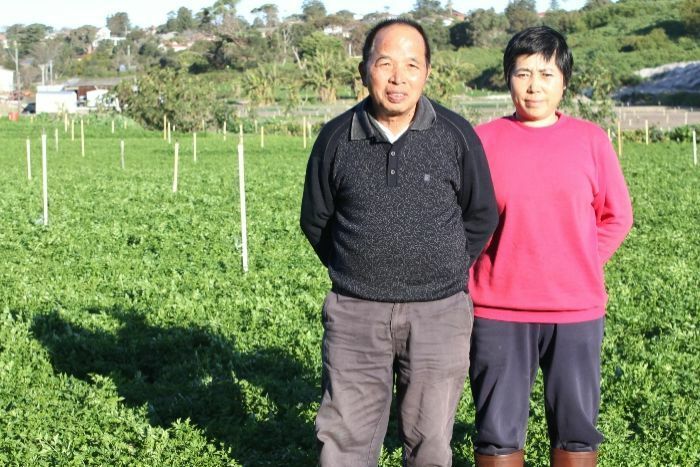 PHOTO: Robert Tang and his wife Jin Zheng Wang standing amongst a crop of parsley. The market gardens are of historical, agricultural and social significance to NSW and to the Sydney Metropolitan area in particular. 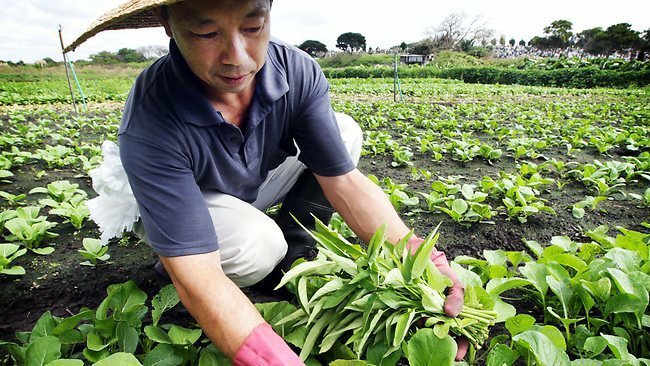 The gardens have been farmed for more than 150 years, firstly used by Europeans and then by Chinese. In terms of historical significance, the area has importance in the evolution of the area from a landscape occupied and modified by the area’s Aboriginal population, to an area adapted to the settlement and food production needs of the European colony. The area also has great social significance for its association with the Chinese immigrants who became predominant in the Market Gardens of this area over the past 100 years. In terms of aesthetic significance, the area has some scenic value, giving it a somewhat rural character which can be viewed from the surrounding area. The place has representative and rarity value. The remaining Market Gardens have the representative value as surviving examples of the Market Gardens which were originally fairly widespread in the area. The Market Gardens also have rarity value as they provide the last remaining evidence in the Randwick area of these early agricultural uses, many former Market Gardens having already been redeveloped for residential use. The Market Garden sites are remnants of earlier and more widespread agricultural uses in the area. In 1961, there were nine market garden leases, confined to two areas in the Randwick Municipality. Four in the Franklin Street, Wassell Street, Knowles Avenue area, and five in the Little Bay Road, Bunnerong Road area. During the 1960s Council made considerable efforts to prevent long-term extensions of these leases by the Crown, in order to facilitate the future use of these areas for residential purpose. A Crown Lands Review in 2008 deemed the land suitable for agriculture but unsuitable for residential and cemetery use. In 2013 RU4 Small Lot Agriculture zoning came into effect. I support the retention of the La Perouse/Phillip Bay Market Gardens for the production of food for Sydney. Any extension of the Botany Cemetery must be opposed as food security will be further threatened by the loss of this gardens.